Claws of a cat are an integral part of his body. Cats are natural hunters, which necessitates it to climb trees and use the claws as a tool for hunting as well as for the purpose of defense. Claws are also used for social signaling, by leaving messages on the surface to convey their authority to other cats. 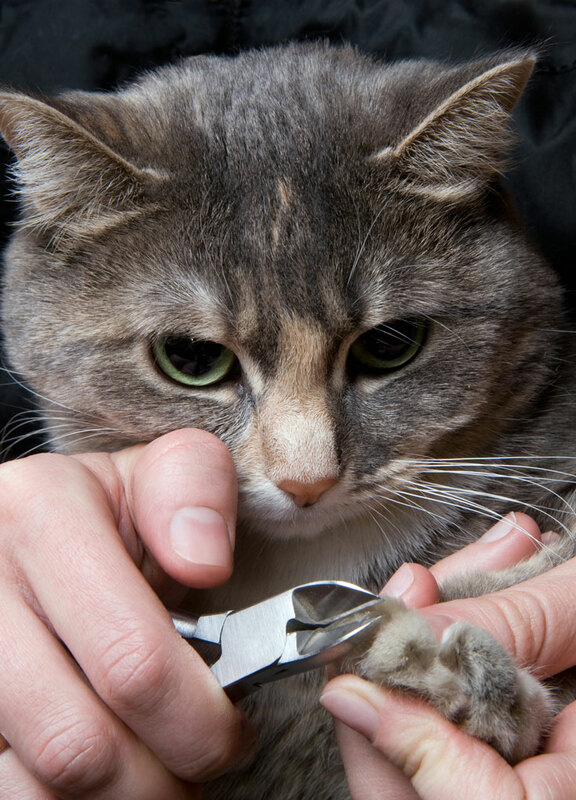 Trimming cat claws won’t be a worry for you if your cat spends a lot of time outdoors. Rough surfaces found outdoors like tree branches takes care of your cat’s claws. Trimming cat claws can be an effort for indoor as well as elderly cats. Indoor cats do not use their claws as much as an outdoor cat does, because it does not need to hunt, defend itself, and will have no other cats to leave any messages. It is still very essential to trim their claws since it is an integral part of cat grooming. Trimming cat claws protects you, your family members, guests, sofas, curtains and other furniture from the sharp scratches. Trimming cat claws is very different from trimming a dogs nails. The whole process requires a lot of patience from your side since their claws is retracted and they do not like anyone applying pressure on their paws. Why should you trim the claws? Trimming claws prevents the nails from growing inwards into their pads, which can sometimes cause pain and infection. Some cats have an extra toe placed above the pad, in such situations the claw does not touch the surface and cause an overgrowth. Claws fulfill the urge of scratching in cats this can be fulfilled by installing a scratch post at home. This minimizes the trimming effort for indoor cats. When the claws grow more it becomes very uncomfortable for them making trimming an absolute necessity. How to Trim your Cats Claws? Make it a rule to start early when they are kittens. It is the best and safe approach to teach your cat to accept the trimming process. Trimming claws is not easy and requires immense patience from your side. Cats are sensitive by nature and do not like anyone touching their paws. Any tension around them instantly shows in your cat’s behavior. So be relaxed. You can find different types of tools for trimming cats claws at your nearby pet store. Select a few important tools that are most suitable for trimming. Whatever be the type of clipper you use make sure the blades are sharp. Blunt blades can irritate and harm your cat. It can cause the nails to split and also bleed. Keep a first aid kit nearby to stop bleeding. Before beginning the trimming process, condition your cat or kitten by holding their paws so that it gets used to your touch and understand that you mean no harm. Temperament of each cat varies and if you immediately go with a sharp tool expecting co-operation from your pet, then you will be wronged. Gently hold your cat without applying force. Some cats may need restraint, but most cats do not like pressure applied on them. Rest your cat between one arm and hold one of his paws with other hand. You can even place the cat on a table and slightly hold one of his paws. Never trim when there are other pets around your cat, near a window, after a play and fight. Once you and your cat is in a comfortable position, slowly take one of the paws in your hand. Use your thumb and pointing finger and gently press down on the top as well as on the bottom of the paw on each joint behind the claw. This causes the claw to widen, carefully clip the sharp edge of the claw with a clipper. Do not go close to the pink part of the nail as there are blood vessels and nerve endings there. Cutting this area will cause pain and blood may start oozing out. If you injure the cat, then gently apply pressure on the tip and dip the claw in cornstarch. Discontinue the process if you feel your cat is upset and angry. You can even clip the rear claws in the same fashion. Trimming cat claws is not easy. Sometimes you may not be able to trim all of them in one go. Take your time and make your pet comfortable before clipping others. 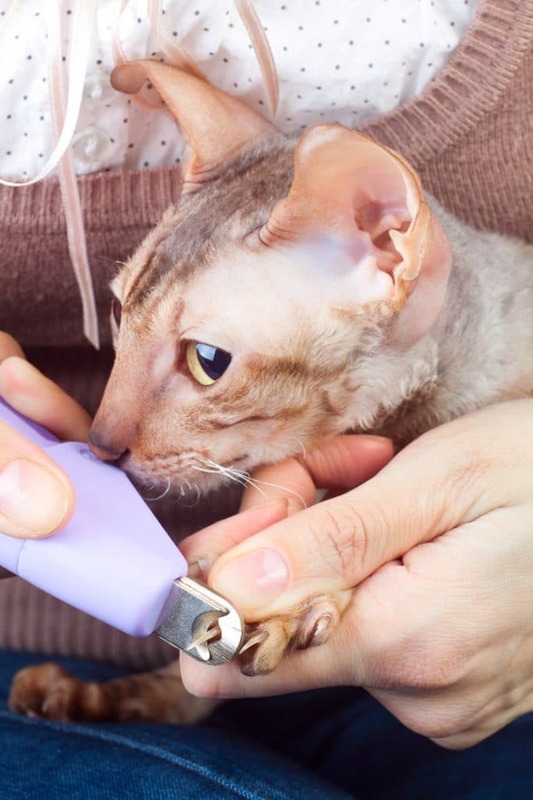 Always use trimmers specifically made for cat claws and avoid using human nail clippers. Do not rush and clip the claws when your cat is agitated. Make the process enjoyable for both of you. Previous articleDo Cats Eat Roaches and It is Safe for Them? Next articleWhat is Feline Acne and How to Cure Them?